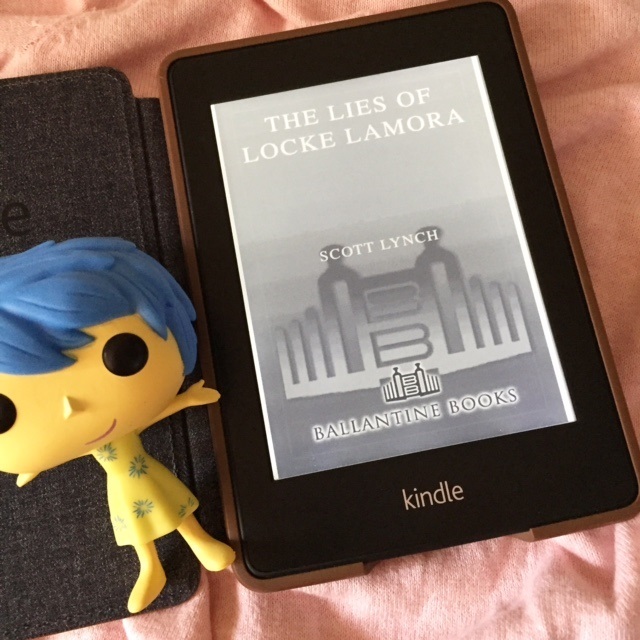 The Lies of Locke Lamora came highly recommended by my husband, self-proclaimed high fantasy purist, although the Gentlemen Bastards series isn’t top on his list. I’ve been meaning to read this and, thanks to the TFG Book Bingo, I finally found the perfect opportunity. Locke Lamora is an orphan. He and his comrades, who will later on style themselves as the Gentlemen Bastards, were trained in various fields – including thievery – by Father Chains, the Eyeless Priest of the Order of Perelandro. Locke and his various disguises, together with his posse Jean Tannen, twins Calo and Galdo Sanza, and their apprentice, Bug, practically bleed the wealthy nobles of Camorr of their money, which they keep under the temple of Perelandro. It is through these schemes and devises that the unidentified Locke earns the title Thorn of Camorr. All is well in their thieving ways until the Gray King decides that he wants to replace the ruling capa, Barsavi, before whom Locke has, as a child, pledged his loyalty. In order to wrest power from Barsavi, the Gray King commissions Locke’s talent, under duress. From there, the Thorn of Camorr and the Gentlemen Bastards find themselves embroiled in the midst of a premeditated plot of revenge. I will agree with everyone who said that this is part Ocean’s Eleven and slightly part Robin Hood – only insofar as the stealing is concerned. The Gentlemen Bastards’ devious ways were amusing, and I must admit I fell for everything hook, line, and sinker. Although Locke lacked fighting prowess, i.e., hand-to-hand combat, his capacity to conjure intricate schemes more than made up for that deficiency. Besides, his best friend, Jean, and his Wicked Sisters served as the brawn of the group. It wasn’t just the Gentlemen Bastards that pulled me in. Although I’ve read better world-building in other books, I still liked Camorr and the other characters. Capa Barsavi, the Spider, the Gray King and his Bondsmage – ooh, the avaricious Bondsmage and his magic.That one has got to be my favorite. Revenge was the moving force behind the plot in this book, and I was so into the story that I actually found myself relishing the parts when it was exacted upon those who were responsible. I also wasn’t surprised when certain characters began being offed left and right – the book practically took a page from the A Song of Ice and Fire series – which I think was necessary, in the grand scheme of things. The thing with plot-driven books such as fantasy books is that they tend to make me impatient – it makes me want to know how everything will all turn up in the end. What happens is that I lose sleep trying to read as much as I can until I get to the end of things, and guess what happened when I read The Lies of Locke Lamora?